Mail artist and exceptionally generous pen pal DumpsterDiver sent me this Mail Tin of Wonders. 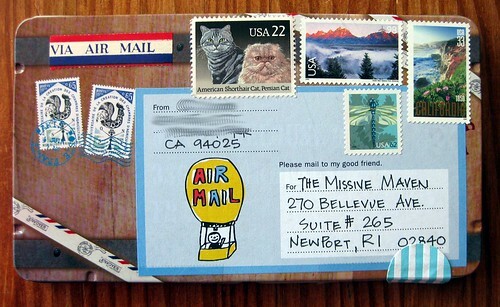 It is a tin that looks like an air mail letter, which she then further decorated with stickers and wonderful stamps. The back/bottom of the tin looks like the back of an envelope. So meta! So love it! Here you can see how thick it is, plus its essential metal nature. Not a light thing to begin with, it was packed chock-full of amazing-mail-ness. The postcard featured a letter on the back, but those awesome rubber stamps are her own hand-carved handiwork. I am PLOTZING over all of them, most especially the mailbox. Here are all the goodies spread out (except the letter opener - that's mine, it just crept into the photo). Stickers, labels, and even a fountain pen + cartridges! The pen is called Riviere, and although the sender rescued most of her items from a dumpster, the pen came from a Daiso, a west-coast Japanese stationery store. Nowhere does it say it is a Platinum pen, but those cartridges look like Platinums to me, and indeed my Platinum converter fits the pen. I guess I should do a full review elsewhere, but all things considered, this is a mighty fine pen. My only complaint is that the clip keeps coming off when I remove the cap, but it's very easy to click back into place. Good writer, if a bit on the dry side. "The Riviere fountain pen, ink cartridges, letter tin, and address labels are from the Japanese dollar store- Daiso. 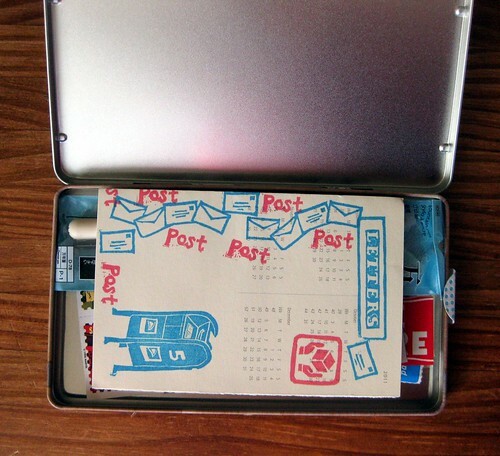 The Moleskine calendar letter started out as dumpster. 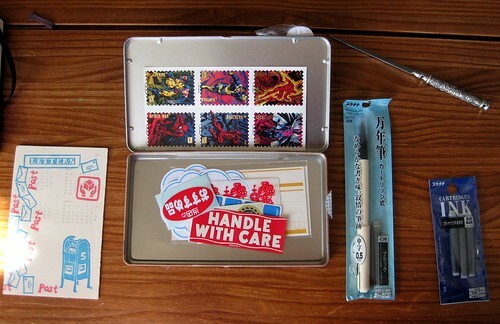 Japanese stickers and San Francisco faux-postage sticker came from Pod Post and their lovely Mailart Bento box. I won the bento box at the raffle during the Good Mail Day Book Launch party!" So WOW! I felt so spoiled when I opened this, and I still do... totally enjoying the labels, stickers, and pen... and I haven't figured out how to properly re-use the tin, but it's sitting on an embellishments shelf and I admire it occasionally. HURRAH FOR GOOD MAIL DAYS! What a wonderful idea this tin is!! And the content must also have been a great surprise for you! 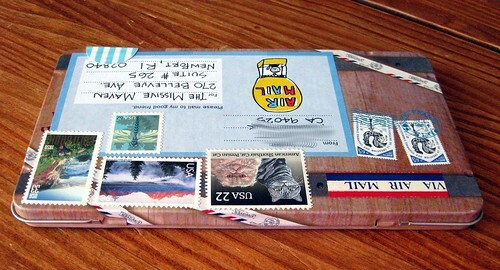 that is just awesome I would pee my pants if i found somthing like that in my mail box oooh weee . 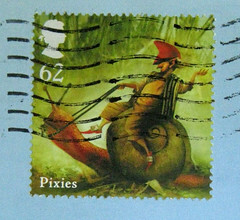 Amazing - what a wonderful mail day that must have been - so full of fun! Wow, what a nifty gifty from DumpsterDiver! This is all so awesome!! And can we please get a Japanese Dollar Store in New England? Please? Thanks all. The mailbox eraser carving was inspired by Pod Post and the Good Mail Day book ( I'm in there on page 119! ). As far as Daiso's plan for conquest of the USA, they have two stores up in Seattle area and a bunch around SF Bay. I'm guessing they hunt for the places in USA with the highest Japanese-American population. I would think the LA area is next. Can't tell if they even know about our East Coast. I just love the generosity of the postally inclined...it is such a joy to receive and send joy bubbles in the mail. Oh, speaking of joy bubbles...thanks so much for the colorful salve for a weary traveler and p.o. 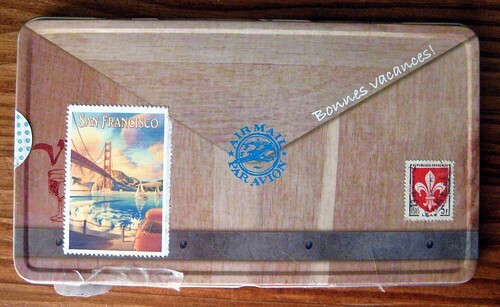 box warming post card. I was so happy to look in and see something in my mailbox! Thanks so much! I vote for a New England Daiso, too! Awesome package, Carroll! Missive Maven is a lucky girl!